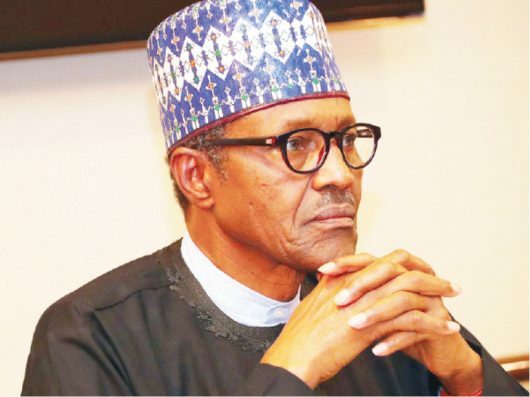 President Muhammadu Buhari, Saturday Feb. 2, freed himself from his re-election campaign to flag off a search for crude oil in the Gongola basin in the North. It was the start of drilling at Kolmani River 11 well in Gombe state. Buhari described the spud-in as the beginning of a concerted effort at raising Nigeria’s crude reserve to 40 billion and daily production level to three million barrels per day. He said oil and gas remained critical to Nigeria’s economy of today and the future, just as they were the key to the success of the country’s budget at all levels of government. Buhari added: “A key execution priority of our Economic Recovery and Growth Plan (ERGP) is ensuring national energy sufficiency and this cannot be achieved through hydrocarbon resources from the conventional basins alone. Therefore, exploration in our frontier basins is a national imperative and a core policy thrust that must be sustained. It is on this note that I directed the NNPC to aggressively intensify its exploration campaign in the inland basins to discover new hydrocarbon reserves that will boost oil and gas production and extend economic benefits to the people within the North-east and the nation at large”. The coverage areas are the Chad, Gongola, Anambra, Sokoto, Dahomey, Bida basins and the Benue trough. While the search for hydrocarbon has been on in the North for about 40 years, the journey to the hydrocarbon sand in Kolmani River started in the 1990s when international oil companies (IOCs) used 2D seismic data to explore for crude oil. The search led to the discovery of 146ft of hydrocarbon sand in the Kolmani River 1 well, with estimated prospects to contain about 33BCF of gas. But the IOCs didn’t investigate deep targets as their drilling was based on 2S seismic data. In 2016 and 2017, a subsidiary of NNPC, Frontier Exploration Services (FES) acquired a 3D seismic data over the Kolmani River Prospects Area in order to determine whether there were any prospects overlooked by the multinationals. Some two years ago, the corporation had started drilling in the Lake Chad Basin, situated in parts of Borno State but suspended the exploration for crude oil following attacks on its workers and military personnel by the terrorist group, Boko Haram. Dr. Maikanti Baru, Group Managing Director of NNPC, said there were a number of “drillable prospects” that would be handled by a consortium of service companies – Messrs Etihad Oilfield Services – and Drilog Petrodynamics Ltd, under a turnkey contract agreement in order to determine the size of gas find and explore deeper targets. He said that with indications of huge prospects based on new technology being deployed and prevailing data from neighbouring countries, the group would lead the efforts across the basins before inviting the private sector. A number of energy sector stakeholders, especially former President of the Nigerian Association of Petroleum Explorationists (NAPE), Abiodun Adesanya, are optimistic about the new development, pointing out that the country would not grow its reserves if bold steps such as exploring for hydrocarbon across the country are not considered. “It is not normal to celebrate and publicize the start of drilling wells, but rather the results (if the outcome is positive) at the end of drilling each well”, he said. “The reason for doing this at this time is, of course, understandable. The science and the data support embarking on this drilling campaign and it is very good for national development”. We at Peoples Daily join the regional socio-cultural, non-political, group Arewa Consultative Forum (ACF) in welcoming the restart of oil drilling in the North and the extension of coverage to other parts of the country. It does not speak well of our national politics that it had to be a president of northern extraction who would order NNPC back to the North after it abandoned oil exploration because it was not profitable. But we knew better. It was all part of a conspiracy to keep up the myth of the North’s dependency on oil money from the South and then use it to push a time-worn restructuring agenda. This said, we warn that the North must not be dulled into complacency by the firm prospects now presented by the NNPC. The efforts at making agriculture the mainstay of the region’s economy must continue. After all, crude oil is a finite source of energy. It is exhaustible.